Despite attacks by police wielding pepper spray and Mace, confiscation of their possession and a series of threats to evict them forcibly from the Civic Center Plaza, over 1,000 members and supporters of Occupy San Diego reclaimed their downtown space October 15. The day was busy, including three marches and two rallies as well as Occupy San Diego's usual open discussion about its goals. The police attempted to shut down Occupy San Diego and drive its anti-corporate activists out of the Civic Center Plaza downtown October 13 and 14. They threatened them with ever-changing deadlines â€” first midnight on the 13th, then 7 that night, then 6 a.m. on the 14th. They confiscated all their tents but one, which they allowed to stay as a symbol. They arrested two activists and assaulted others with pepper spray. But on Saturday, October 15 the occupiers came roaring back for a long day including a long-planned rally against austerity at Sixth and Grape in Balboa Park and a march to the Civic Center. Some of the occupiers defied police by starting at the Civic Center, marching to Sixth and Grape for the rally, and then marching back! After the march, protesters staged another rally, this one under Occupyâ€™s own auspices and considerably more free-form than the one in the park, and after a short break they went off on their regular 4 p.m. march through downtown, followed by an open debate at 5 on the purposes and future of their action. Occupy San Diego is an offshoot of the worldwide Occupy movement, which started five weeks earlier in the streets of New York as Occupy Wall Street. The New York activists were in turn inspired by the marches and rallies held by fed-up activists in Arab countries like Tunisia, Egypt, Yemen and Syria, which in the first two countries actually brought down long-established dictatorships. The Occupy movement has been criticized for not having a formal leadership structure or a pre-set list of demands, but its members clearly regard that as a strength, not a weakness. Certainly there was a dramatic contrast between the two rallies. The one in Balboa Park was a more traditional Leftist event, with speakers clearly identified and carefully selected to represent the groups in the coalition that had put it together. The Occupy event was much more elastic, with many speakers identifying themselves either by first names only or not at all, taking advantage of an open mike, talking about their personal experiences at the occupation site and telling their own stories to explain why they were there. Michael Anderson, Queer activist with the San Diego Alliance for Marriage Equality (S.A.M.E.) and one of the â€œEquality Nineâ€� facing prosecution for a sit-in at the San Diego County Clerkâ€™s office in August 2010, gave a roaring speech lambasting the Obama administration because all itâ€™s done for Queer rights is repeal the â€œdonâ€™t ask, donâ€™t tellâ€� policy forbidding Queers from serving openly in the U.S. military. As far as Anderson is concerned, Queers shouldnâ€™t want to serve in the U.S. military because all theyâ€™ll be doing is fighting, killing and dying to promote U.S. imperialism and the ability of U.S. corporations to rip off the resources of other countries. Lorena Gonzalez, CEO and secretary-treasurer of the San Diego/Imperial Counties Central Labor Council, spoke at the Civic Center and asked the crowd for acknowledgment that the labor movement was supporting Occupy but wasnâ€™t trying to dominate it. â€œI am proud to be a first-generation American, a Christian, a mother, a union leader and a member of the 99 percent,â€� she said â€” referring to Occupyâ€™s rallying cry that they arenâ€™t part of the richest 1 percent of Americaâ€™s population who owns 50 percent of the nationâ€™s wealth. The rally at the Civic Center was disrupted by two people. One was a woman who came with a fifth of vodka in her purse and a bandage around one arm. The other was a man who proclaimed that he was running for President and asked people to visit his Facebook page. Ironically, though he was denied access to the (otherwise) open mike, the issue he wanted to address was one that the anti-corporate Left considered central a decade ago but which none of the speakers brought up: the recent overwhelming approval by the U.S. Senate of pro-corporate, U.S. job-killing â€œfree trade agreementsâ€� with South Korea, Colombia and Panama. 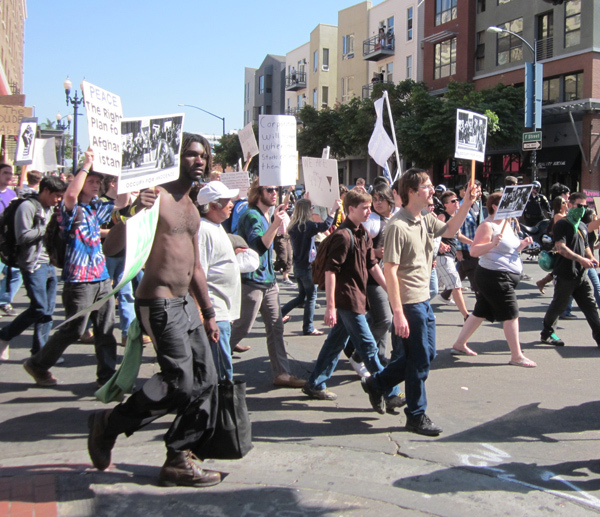 After the rally the occupiers rested briefly and then regrouped for their daily 4 p.m. march through downtown. Though the businesses in the financial district were closed, the activists had fun yelling abusive, sometimes obscene slogans against Bank of America and Wells Fargo as they passed their headquarters. They made sure a few people stayed behind to secure the one symbolic tent left at the Civic Center from any attempt by the police to remove it. Then they returned for another scheduled event, a 5 p.m. open discussion to work out the movementâ€™s priorities and goals.